The Sun Mar Excel NE is rated for 2 adults or a family of 3 on a constant basis or 5 adults or a family of 7 on a weekend or holiday basis. First launched in 1981, the Sun Mar Excel NE (Non Electric) has proven to be the standard for composting toilets in passive house applications. Like all Sun Mar composting toilets it features the Bio-Drum (video) that allows the rotation of the compost in the unit. This aerates and mixes the compost so that composting is at optimum. Use the handle at the front to rotate the drum every two days to mix and aerate the compost. Once a month or so roll the drum anticlockwise to drop some compost into the finishing drawer where is remains for at least another month to break down. This method means that you never have to handle any unbroken down waste. The Sun Mar Excel NE composting toilet has no fan or heater. Odorless operation is achieved by a 4″ vent mounted at the top rear of the unit which acts like a chimney on a wood stove. For optimum air movement the vent should be installed vertically with no bends and to 2-3 feet above the peak of the roof. The optional 12 volt inline fan should be installed if you need to install the composting toilet with any bends in the vent. No more than two 45° bends are recommended, even with the fan. If the Sun Mar Excel NE is used residentially or heavily, or is in a place which is subject to downdraft, the optional 12 volt fan should be installed in the vent stack. Evaporating capacity on the Sun Mar Excel NE composting toilet is variable as it will depend on the ambient temperature. The 1″ drain at the rear should be connected to an approved drain soakaway or container. The Sun Mar Bio Drum is an integral part of the composting toilet. Composting requires an environment where there is warmth, moisture, organic material, and oxygen. Sun-Mar creates this ideal environment in the patented Bio-Drum. The unique Sun-Mar Bio-drum ensures aerobic microbes flourish, which work much more quickly to break down waste in the composting toilet and convert it back to earth. Waste and mulch enter through the waste inlet port at the top of the drum. To mix and aerate, rotate the drum periodically, simply by turning the handle on the front of self-contained units or on the side of centex units. During rotation the inlet door closes automatically keeping the compost in the drum. To empty compost from the composting toilet simply release the drum locker and rotate the drum backwards. Now, the inlet port in the Bio-Drum opens automatically and compost drops directly into the compost finishing drawer. After rotating, the Bio-drum locks itself in a top dead center position ready to receive new material. Sun-Mar’s unique Bio-Drum design allows the user to roll the compost through 360 degrees. It is the easiest and best possible way to thoroughly and completely mix and oxygenate the compost. Rotate the drum, and the entire compost pile is tumbled and infused with oxygen. Oxygen is one key ingredient which allows aerobic bacteria to break down waste quickly and without odor. Moisture control, the other basic requirement for good composting, is one of the outstanding benefits offered only by Sun-Mar’s Bio-drum. Below 40% moisture content, composting slows and eventually stops completely. By not applying direct heat to the compost, Sun-Mar ensures that it does not dry out. In addition, the tumbling action during periodic mixing distributes moisture evenly throughout the compost. The ideal moisture content in the composting toilet is 40-60%. Above 60% moisture content, liquid starts to drive out the oxygen in the compost, and the compost becomes increasingly anaerobic,- like a septic system. Sun-Mar’s unique Bio-drum optimizes composting speeds by automatically draining any excess liquid through a screen at the bottom of the drum directly into the evaporation chamber. The microbes generate their own heat as they work. This warmth is held in the compost by the mass of material inside the drum, supported by indirect heat from the base heater (in electric units). By avoiding direct heat, Sun-Mar ensures that composting will not slow down as the material gets dried out. Uneven distribution of oxygen and moisture allows anaerobic bacteria to take over. These microbes produce bad odors and do not allow the waste to break down quickly. The superior oxygenation and moisture control provided by the Bio-drum provides the ideal environment for aerobic bacteria to odorlessly break down organic material. They quickly convert organic material into water and carbon dioxide, and leave behind simple salts which are ideal for uptake by plants. 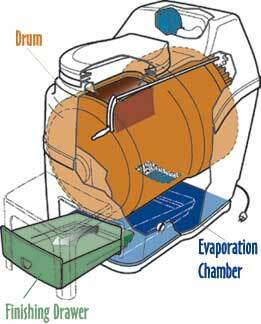 The second chamber in the Sun Mar composting toilet is the evaporation chamber. Compost must be kept moist but not saturated. Excess liquid from the Bio-Drum strains through a stainless mesh screen onto the evaporation chamber. The Sun Mar evaporation chamber maximises evaporation of liquid due to the large surface area combined with heat and moving air. On all Sun Mar Centrex composting toilets the liquid falls first onto an evaporating tray and then to the main evaporating surface. The tray not only helps oxygenate this liquid, it also traps any peat mix debris, and almost doubles the evaporating surface. Evaporating trays can be removed and cleaned if necessary, through the door opening on the Centrex 2000 composting toilets, and through the drawer access port on Centrex 3000. For optimum results evaporation is assisted on 230 Volt electric models by a thermostatically controlled heating element. Sealed in a compartment underneath the evaporating chamber, the heater warms the floor of the evaporating chamber without drying out the compost. In non-electric units, although some liquid is evaporated by passive venting, the overflow drains must always be connected. Composting can be completed in the drawer without contamination by fresh waste. The composting toilet finishing drawer is the third chamber and it serves two functions. To receive the compost in an easily accessible isolated container, and complete the composting and sanitation processes. Compost drops directly into the finishing drawer when the drum is rotated backwards/ anticlockwise. Composting is completed in the drawer, where it is isolated from fresh waste and possible contamination. While in the drawer, the compost is surrounded by a stream of drying air, and gradually dries prior to removal. The finishing drawer is removed by hand, and the sanitized compost may be emptied whenever more compost is to be extracted from the drum. For seasonal units, several drawers may be removed in the Spring, reducing the compost level in the drum to 6-8 inches to make room for next year’s operation. There are two compost finishing drawers in the Centrex 3000 series. Both are easily removed by hand and are interchangeable. The first drawer is inside the collection housing at the side of the unit. This is where the finished compost automatically falls after leaving the second section of the Bio-drum. The second drawer is located inside the unit. Moving compost from the first drawer to this second station allows the composting cycle to be extended if necessary. This can help ensure the compost is safe to handle. For seasonal units, the second section of the drum can be emptied in the spring by rotating the drum backwards/ anticlockwise and dropping compost into the second drawer. Listed composting toilet capacities refer to the amount of people, on average, using the unit per day. Do not pick a unit that is below your capacity. All vent should be vertically installed. 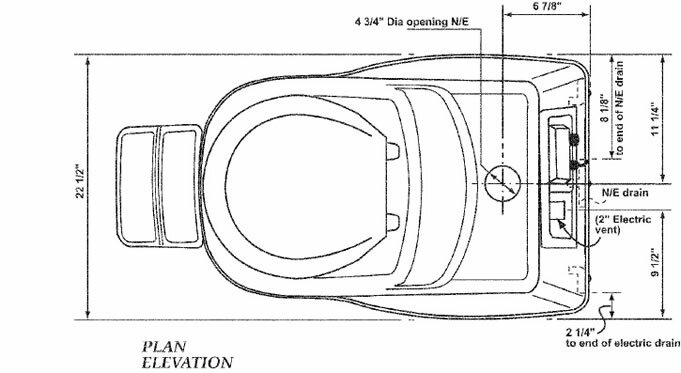 Limit bends in the vent stack to no more than 2 – 45 ° bends. There should be no horizontal sections of vent. Install the vent so it terminates 24 to 30 inches above the highest peak of the roof. If more than 36 inches of vent needed above the roof line to reach required height, use guide wires to secure the vent above the roof. If you will be installing venting on a steeply pitched roof where snow shear may occur; Install a thicker gage pipe through the roof and feed the supplied vent through the thicker gage pipe. Seal between the pipes with expandable foam or other such water-tight substance. The vent must be installed separately from ALL other household vents. All connectors in the vent pipe should be joined using PVC cement. The only exception is the connection between the vent and the unit where silicone caulking should be used. The diffusor should be glued vertically on to the top of the vent pipe. This assembly helps draw air up the vent pipe. Operating a Sun-Mar composting toilet is easy. There are two things that you have to do on a routine basis – rotate the drum and add bulking material, at the rate of a cupful per person per day. When it comes time to empty, you are never dealing with fresh waste; when the drum is 1/2 full, you rotate the Bio-Drum backwards by releasing the drum locker and dump some compost into the finishing drawer. Leave it there to finish batch composting for 4 weeks. If large lumps develop in the drum break them up with the rake to ensure good aeration. The following sections give more detail on use and maintenance. Please also see our installation section for more detail. ADD 10-15 litres of peat mix (roughly half the 30 litre bag provided) to the drum. Provides Carbon base and initial mass for compost. ADD 1/2 Microbe Mix packet at startup, other 1/2 in two weeks (or on next visit if in cottage use). Adds necessary microbes which will break down the compost. RAKE Loose peat moss from the evaporation chamber until the compost is established, which takes approximately 6 weeks. 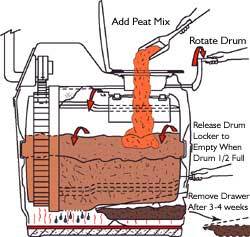 Until the compost is active, some peat mix may fall through the screen or drum door into the evaporating chamber. Add 1 cupful (or 2 handfuls) of Sun-Mar Compost Sure (or 50/50 mixture of peat moss and non-cedar wood shavings) to the Bio-Drum after every bowel movement. This usually represents one cupful per person per day of use. If you have a central unit, peat mix only needs to be added when you do your rotations at the end of the weekend (cottage use) or once every 2nd day (residential/weekly use). Rotate the drum 4-6 complete revolutions, three times a week when the composting toilet is in use, or, if used only at weekends, only on departure. If you are leaving for a period of more than a few days it is best to power the composting toilet down. Consider installing a timer to shut the composting toilet off after 48 hours to evaporate excess liquid. If you are leaving for a period of more than few days, or the compost appears dry, add approximately 1/2 gallon of warm water before leaving to keep the compost moist. unplugging composting toilet will conserve power and keep compost from drying. Empty some compost into the finishing drawer when the Bio-Drum is 1/2 full. To empty some compost into the finishing drawer, pull the drum locker button and rotate the handle counter-clockwise. Turn at the same speed you would normally do for mixing. If necessary, use the rake to level the compost in the drawer. Leave the compost in the finishing drawer to finish for 4 weeks or until you next need to remove compost from the drum. If your unit is used seasonally and is not used heavily, you may not have to remove any compost at all during the season. Provides Extra Time for composting to be completed. What To Do with the Composting Toilet at the Beginning of the Season? Empty any compost that had been left in the finishing drawer, and use the rake to clean out the evaporation chamber, paying special attention to the back two corners of the unit (or left hand side if it is a Centrex family unit). This is a good time to remove peat debris from the evaporation chamber. Remove additional drawers of compost if there is more than 6 to 8 inches (150-200mm) of compost in the Bio-Drum. This is done by releasing the drum lock, and rotating the handle counter-clockwise to extract compost into the drawer. Since it will have been sitting over the winter and decomposing in the fall and spring, it will be finished and may be removed immediately, without any extra time needed to finish the compost in the drawer. Several drawers may be removed in this fashion if necessary. Be sure to leave 6-8 inches of compost in the composting toilet to start off the season with a “starter batch” of compost. Frees space in the drum for the new season’s composting. Add 2 litres of warm water. Add Sun Mar Microbe Mix or unsterilized black earth from a garden center. We do not recommend using topsoil as it may contain fly larvae, and may not contain all of the bacterium required. Sun Mar Compost Quick enzyme can also be used as a compost accelerant. Even though the compost still has microbes in it, you may want to start the year by replenishing microbes. Products are only certified by NSF after an exhaustive 6 month test. Backed up by satisfactory experience in the field which requires, amongst many requirements, that there is no odour, even during overload testing, the compost produced has to contain extremely low levels of faecal coliform. Only products certified and listed by NSF may bear the NSF mark, which is required by many regulatory bodies to prove that the composting toilet does indeed meet the NSF standard. Sun-Mar composting toilets are alone in being able to bear the NSF mark as being certified for cottage and residential use. View the “NSF/ANSI STANDARD 41 Non-Liquid Saturated Treatment Systems” Listing Page here. Q. How much odour comes from a composting toilet? None. Air is being continuously drawn in to the unit and up the vent stack, creating a partial vacuum in the unit. In addition, the composting drum fosters a good aerobic compost which produces no odours. Q. How often do you empty a Sun Mar Composting Toilet? Never completely. You typically empty some of the compost out of the drum once per year for cottage use, once every few months for residential use. In cases of continuous use, you may extract some compost more often. This always sits in the drawer to cure before being removed – you are never handling any fresh waste when the unit is properly operated. Q. Do I add any chemicals to the Composting Toilet? No. The only thing that is added is mulch (60% wood shavings, 40% peat moss, or Sun-Mar’s Compost Sure peat mix with hemp). Chemicals are, in fact, dangerous to the composting process and should never be added at all. Q. What happens in the winter? Nothing. The compost remains in the drum and freezes, so no composting is taking place. The elements will NOT damage the system during the winter months. In fact, waste can be added in limited quantities during the winter for use as a holding tank, if you are only planning to use the composting toilet about once a month. Q. Can the composting toilet be used all winter? Yes. If the area where the composting unit is heated to a minimum 13 degrees Celsius throughout the winter, then composting will occur. Q. How much electricity do they use? Q. What if no electricity is available? No problem. 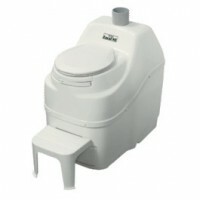 Each Sun-Mar composting toilet is available in non-electric version. Q. How do you clean it the Composting Toilet? You only have to clean the bowl (in a central system) or the bowl liner (self-contained unit) as you would a regular bowl, except without the use of chemicals. Recommended cleaners are Sun-Mar Compost Quick or hot water that is mixed with baking soda or vinegar. Q. Does the Fiberglass used in Sun Mar composting toilets smell? No. Off gassing from the fiberglass production process does produce an odor, but it is gone by the time that the composting toilet is built and boxed. Q. What kind of plastics Are used in production? We use high quality, recyclable, cold-resistant plastics. Sun-Mar engineers use the best materials for each part of the composting toilet. We find that this produces a better product than using one material throughout. Q. Where are Sun Mar Composting toilets built? At our plant in Burlington, Ontario, Canada. Please feel free to come and see us anytime during business hours. Q. How Do You Get the Most Capacity out of a Composting Toilet System? Different sizes of drums. Common sense tells us that more people means more waste, and for more waste we need a bigger composting vessel. Sun Mar is the only company that offers a larger solution for a larger problem. Q. Why are you saying that you have the only Residential and Cottage use systems certified and listed under NSF (National Sanitation Foundation) Standard 41? The facts are right here on NSF’s website. We have the only Residential and Cottage use composting toilet systems certified and listed under NSF Standard 41. If you have any questions please contact NSF directly. Q. Why does no-one else use a drum inside a composting toilet? They can’t. 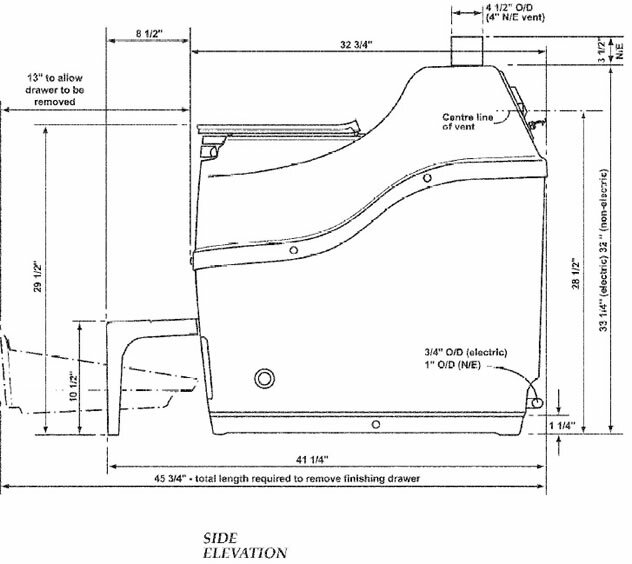 Many of our drum design features are patented. All Sun Mar composting toilets carry a full 5 year replacement warranty on the fiberglass tank and a comprehensive 3 year replacement warranty on all other parts. Q. What parts wear out? Like brakes or tires on a car, certain parts eventually need to be replaced. On Sun-Mar composting toilets, the fan and the thermostat can fail after a number of years. In both cases the parts are relatively inexpensive and are easily accessible for you to repair. Q. Is the Fan Noisy? The fan on AC composting toilets is just as noticeable as an oscillating room fan in terms of noise level. If you are concerned about fan noise being a problem, you can purchase a fan speed control with your unit that will allow you to turn down the fan speed, and therefore the noise, whenever you like. You may have heard from users of older Sun-Mar units (pre-1998) that their fans were noisy. They were noisier than the current model, as the fan was from a different manufacturer and of an entirely different design. Just another example of how we are always improving your composting toilet experience. Q. On a central system, how far away from the toilet bowl can the composting unit be located? Up to 15 feet (4500 mm) is usually safe. We have encountered cases that have had longer distances, but in every case we recommend that you carefully follow installation instructions. It is very important that you carefully measure the slope of the pipe in any case. Q. How many toilets can I hook up to a central composting toilet system? You may connect up to 3 toilets to any one system. The amount of toilets is not as important as the number of people using the system. Q. Can you throw toilet paper in the Composting toilet? Yes. The paper is a source of carbon for the compost. You do not need to buy special toilet paper to use in our system, as a properly operating compost will break down regular toilet paper in a short period of time. Of course single ply will break down faster. Q. Should males still urinate outside or in the outhouse? No. In fact, the liquid is beneficial to the composting process.